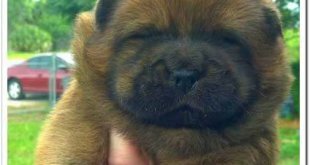 About Chow Chow Learn about history, behavior, health, care requirements and breed standards for Chow Chow dog breed. We have training tips as well. Entropion is a medical condition that occurs when the eyelid edges turn inward towards the eyeball instead of outward. This is a condition that usually occurs within the first six months of life but can become present later in life following other eye changes in the dog. The condition usually affects only the lower eyelid and entropion is considered to be an inherited disease, so it is mainly a genetic condition; however as we will discuss later this disease can be environmental. 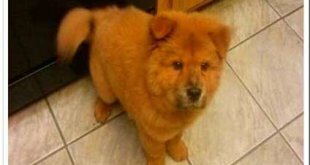 This disease can affect many purebreds other than the Chow Chow, such as the Great Dane, English Bulldog, Shar-pei, and the Labrador Retriever, among others. A veterinarian can complete an ocular exam. This exam will allow the doctor to look at the position of the eyelid and search for underlying causes for the entropion. Some underlying causes of entropion are abnormally placed or ingrown eyelashes. 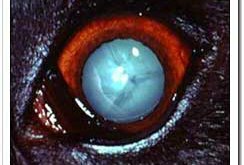 In addition, the vet will use a fluorescent dye to check for corneal ulcers caused by the lashes rubbing against the cornea. Currently, there is no medical therapy to correct entropion; surgery is required. There are two surgery types available; one involves removal of skin, one does not. The procedure that does not require the removal of skin is usually performed on dogs under the age of 6 months and is most effective for cases of entropion that are just beginning. In this procedure, doctors use sutures or staples to pull the eyelids outward. The other treatment involves the removal of skin near the eyelid margin. This surgery is recommended for a more permanent fix. There are several different techniques doctors use to remove the skin, depending on the location and severity of the entropion. The goal of both procedures is to return the eyelid to a normal state and keep hair off the cornea. Keep environment clean to avoid disease. 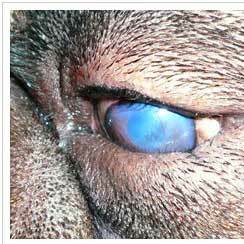 Entropion is a disease caused by genetic and environmental which happen in the eyes of dog.